The Moroccan Meteorological office denied on Monday rumours, which stated that a Tsunami could hit the Atlantic Ocean after the fall of fragments of a comet that would pass close to earth on May 25, MAP news agency reported. This denial comes after the Ufological Research Center warned on its website of a Tsunami danger that would affect several countries, including Morocco. Eric Julien, author of La Science Des Extraterrestres made an alert in his website about Tsunami. He claims that he has received information psychically, which is corroborated by scientific data, according to which on May 25, 2006 a giant tsunami will occur in the Atlantic Ocean, brought about by the impact of a comet fragment which will provoke the eruption of under-sea volcanoes. He said that waves up to 200 m high will reach coastlines located above and below the Tropic of Cancer. He added that all of the countries bordering the Atlantic will be affected to greater or lesser destructive and deadly levels. Eric Julien's history is full of defamation and lies. In May 2004, he claimed that he was kidnaped by aliens to teach him how to drive UFOs. The head of the Meteorological Office, Mustapha Janah, told MAP news agency "the Ufological Research Center does not have technical means" to observe this kind of phenomenon. Citing the American space agency "NASA," the official noted that the comet will pass away from planet earth at about 10 million kilometres, excluding hence any risk of a Tsunami in the Atlantic Ocean. Yet, it didn't prevent many Moroccans from Panicking. Some already packed to go to the mountains; others decided to travel to another country. Even those who believe it is only a rumor are anxiously waiting for May 25. The last Tsunami hit the Indian Ocean on Dec. 26, 2004. It was caused by a 9- magnitude earthquake which killed nearly 150,000 people throughout the region, and left more than 1.5 million homeless. The 2004 tsunami is the worst in recorded history. 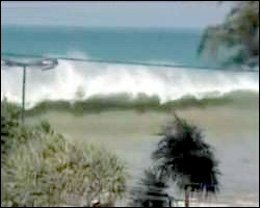 Prior to 2004, the deadliest recorded tsunami in the Pacific Ocean was in 1782, when 40,000 people were killed by a tsunami in the South China Sea. The tsunami created by the 1883 eruption of Krakatoa is thought to have resulted in 36,000 deaths. The most deadly tsunami between 1900 and 2004 occurred in 1908 in Messina, Italy, on the Mediterranean Sea, where the earthquake and tsunami killed 70,000. The most deadly tsunami in the Atlantic Ocean resulted from the 1755 Lisbon earthquake, which, combined with the toll from the actual earthquake and resulting fires, killed over 100,000.